Make Some Slippery New Friends! Sea Life Park is the best place to go for swimming with Sea Lions on Oahu! Imagine getting this close to a family of adorable, loving sea lions. Our Sea Lion Discovery activity lets you swim with sea lions and interact with these fabulous creatures. Guests receive a unique opportunity to swim with a Sea Lion in a playful, educational, and interactive atmosphere. During the program, guests will be able to stroke a sea lion as the sea lion swims underwater. Go ahead and pet, kiss, or hug them. You will have the time of your life joining them in the water and watching these nimble characters carry out their daring acrobatics and spectacular jumps. 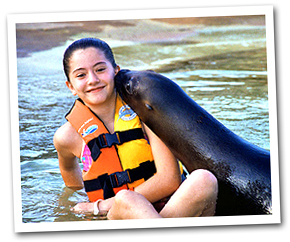 Guests will receive a performance and kiss from their sea lion! Act as a trainer and learn to communicate with the sea lion. Our sea lion trainer will teach you how to give commands using a special signal system. 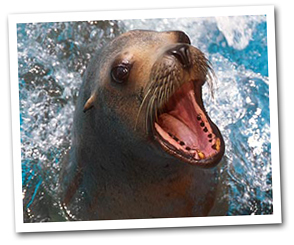 Photos with your Sea Lion are available for purchase weather permitting. Make some new, slippery friends - Reserve your spot and get to know our sea lions! Program lasts approximately 45 minutes (30 minutes in the water).